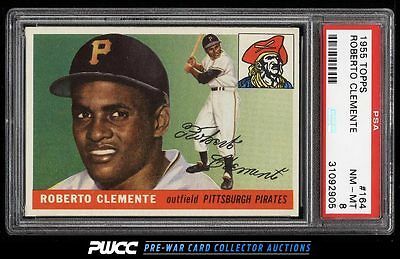 In the world of high grade Clemente RCs, there are typical PSA 8s and then there are exceptional PSA 8s; this is the latter. By far the single finest Clemente RC we've brokered in our history and may be among the finest 5 or 10 PSA 8s in the world. Near perfect centering with four exceptionally well formed corners, chipless edges, and near flawless print (not to be overlooked) cloak every spot of this card. Considering the wide range of quality within a grade, we believe the value increase for high-end examples is an idea only starting take hold in the industry; as such, quality examples seem to afford the savvy investor a special opportunity. We love this card for obvious reasons and highly recommend it. As good as it gets for the grade. One of nearly 20,000 cards, lots, and sets up for bid in our 7th Auction of 2016. Click on the link above to view the other PWCC auction lots.